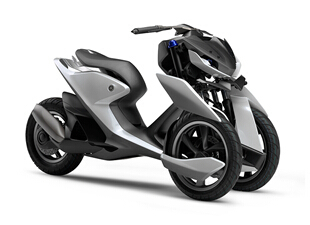 Third Concept Model Based On Refined Dynamism Design Philosophy - News Releases | Yamaha Motor Co., Ltd.
IWATA, March 25, 2015 – Yamaha Motor Co., Ltd. (Tokyo:7272) announced today that it has built two design concept models based on the twin front wheels Leaning Multi Wheel TRICITY – 03GEN-f and 03GEN-x. Out of which, the 03GEN-f will be exhibited at the 36th Bangkok International Motor Show from March 23. The 03GEN-f was designed with the underlying theme "Future Racing", and it visually expresses both the futuristic feel – which is expressed by emphasizing the Leaning Multi Wheel mechanism – and Yamaha's racing image. 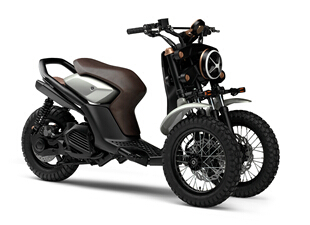 The 03GEN-x, on the other hand, with "Cross" as its underlying design theme, combines both an advanced-looking frame that exposes the three wheels and the traditional off-road design that is reminiscent of the days of unpaved roads. While being based on TRICITY, the two concept models exemplifies the design possibilities of the Leaning Multi Wheel by offering a sharp contrast to the production model through various design factors including CMF (color, material, finish). Yamaha Motor, which has positioned design as a central pillar of product creation from its founding, established Refined Dynamism as its design philosophy in 2013, and are putting energy into developing products that realize the unique style of Yamaha. Based on this philosophy, the company announced its GEN concepts 01GEN (a large crossover motorcycle with a twin front wheels layout) and 02GEN (an electrically power assisted wheelchair) on October 2014 and November 2014 respectively. The 03GEN is therefore the third expression of the GEN concept. Yamaha Motor will continue to exhibit and propose its GEN design concept in the future.